A friend shared this on facebook. I appreciated Elaine’s kind comments. I’ve been touched by how many people have expressed appreciation for what I’m doing here. So anyway, this one’s very “meta” because one wonders how many people ask themselves, before sharing it, whether it’s true or not. Ahem! “Monks, a statement endowed with five factors is well-spoken, not ill-spoken. It is blameless & unfaulted by knowledgeable people. Which five? “It is spoken at the right time. It is spoken in truth. It is spoken affectionately. It is spoken beneficially. It is spoken with a mind of good-will. Here’s another quotation from the suttas. You’ll notice that the style is less streamlined and less polished than in our suspect quote, and there are four or five guidelines mentioned, never just three. But this still seemed like it might be a partial paraphrase of a genuine quote. And what other five conditions must be established in himself [i.e. a bhikkhu who desires to admonish another]? I had begun to convinced myself that the quote was a slightly clumsy and incomplete paraphrase of that last quotation, but I dug a little deeper, and was glad I did, because I tracked the quote back to a book of Victorian poems! It’s from “Miscellaneous Poems,” by Mary Ann Pietzker, published in 1872 by Griffith and Farran of London (at the “corner of St. Paul’s Churchyard”). So the finding of this source moves the quote from being suspect to being definitely a Fake Buddha Quote. Perhaps the Rev. Mr. Stewart was the originator of the formula used in this quote. Perhaps he’d encountered Buddhism, or perhaps (and I think this is more likely) it’s simply a coincidence that he arrived at a form of words similar to Buddhist teachings. It is one of Rumi’s quotes. From the Mehsanvi. The Masnavi is available in full online, SirPico. Would you be kind enough to point out where in it this quote is found? Is it not quite likely that the Victorian author had come across one of the early loose paraphrase versions of a life of the Buddha? I can’t remember the name of the famous one right now, but I have an early copy of it somewhere. If the Victorian author had read a loose paraphrase of a Buddhist source and since it is at least compatible in meaning, is it not more fake-ish than fake? That’s an interesting idea, but far as I’m aware, Kester, there were only one or two translations that had been done at that time, and those weren’t from the Pali canon. So it’s more likely that the similarity to Buddhist teachings is coincidental. Well, perhaps not exactly coincidental, but rather an effect of convergence. Kind minds think alike. They do indeed. Also, reality is a constant. Speaking untruthfully, without good reason, and unkindly is going to have observable deleterious effects. Observant minds think alike, too. Do you have a source, Paul Bailey? It’s mentioned on this Goodreads page (https://www.goodreads.com/quotes/823818-is-it-true-is-it-kind-or-is-it-necessary) with a source in this book (https://www.goodreads.com/book/show/2300113.Essential_Thinkers_Socrates?from_choice=false&from_home_module=false), but as that’s a compilation, I don’t know that it moves us much closer. Sorry! Yes, I’m afraid that doesn’t tell us anything, SR. 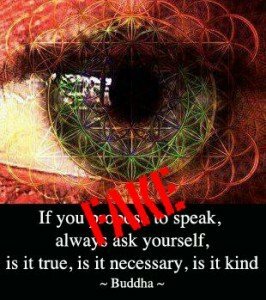 There are entire books of “Buddha Quotes” now available that consist mainly of the fake quotes you’ll find on this site. Basically, it’s easy to make a “book” these days and put it up for sale. The easiest way to make a book of quotations is to lift them from websites. The same is, I’m sure, true for quotes from Socrates and other figures. Yes! There does not necessarily need to be a doctrine for this. Sometimes you feel a certain way and then there is a written word somewhere to reinforce that way of thought. Everything really is so simple however it is nice to read about reinforcement of that process that we have never given a step process to. Lets spread the word of what is right and positive. It really is that simple. So you’d think, Simon, but that’s scarcely possible, given that the “true, necessary, kind” formulation dates back to the early 1800s, before the Pali scriptures were translated into English. The similarity seems to be coincidental. If you’d like to find evidence for such a scenario, feel free, Simon! But it doesn’t seem very likely. I really admire your work. Thank you. This is a quote from Socrates. I learned it in school, but I don’t have a reference. Well, you need to find a reference, or yours is simply one of many competing claims and simply adds to the confusion rather than clearing it up. Well, the whole existence of this site is due to the fact that people misattribute quotes, and that misattributed quotes are endlessly repeated, so the existence of multiple attributions to Socrates means nothing at all, really. The only thing that matters is an original source. Socrates wrote nothing, so in this case that means finding something in the writings of Plato, Xenophon, or anyone else who was in a position to quote him directly. That’s not a large body of work, so it shouldn’t be hard to find the quote if it exists. Amen. Yours is true inquiry, and I respect and laud it. I’ve heard this in Quaker circles, as the “three sieves” to ask before speaking. It’s probably perennial wisdom, so no need to compete for who said it first. This reply is 5 years after the original post, but I wanted to offer another source of the quote- in “At the Feet of the Master” a book written by J. Krishnamurti ( aka “Halcyon” or “Alcyon” depending on your language source) in 1910, he writes, ” It is well to speak little; better to still say nothing. Unless you are quite sure that what you wish to say is true, kind and helpful. Before speaking, think carefully whether what you are going to say has those three qualities; if it has not, do not say it.” Beautiful advisement from a beautiful teacher. Thanks. This has the same general idea (one has true/kind/helpful and the other has true/kind/necessary), but it’s not the same quote. The general idea that we should pay attention to our speech must be as old as ethics itself, and the somewhat more specific notion of there being multiple components of ethical speech, such as Krishnamurti’s true/kind/helpful, the Victorian true/necessary/kind, and the Buddha’s true/kind/helpful/harmonious/timely keeps cropping up over and over. 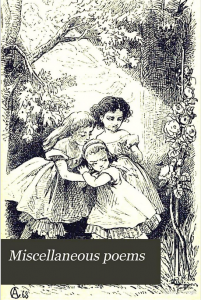 It’s possible that K’s formulation was derived from the one expressed by Mary Ann Pietzker, but it’s probably not possible to say with any certainty. J. Krishnamurti’s true-kind-helpful formulation may have been inspired consciously or unconsciously by the Bhagavad Gita. In 17.15, Krishna explains discipline of speech, saying “satyam priya-hitam ca yat”: words should be true (satyam), kind or loving (priya), and beneficial or helpful (hitam). The Sanskrit “priya” has several meanings, including “loving/dear”, “kind” and “agreeable/pleasing”. So which is it? Sages and seers like Vidura and Bhishma spoke strong words to the blind emperor Dhritarashtra (with whose question the Bhagavad Gita begins), and these words were always truthful, loving and beneficial; they were not always agreeable or pleasing to the emperor, though. Pleasing in the sense of flattery or of being biased or selective or only saying what someone wishes to hear would contradict truth, so “priya” has to be taken in the sense of coming from a kind or loving place. Interestingly too, the word “ca” (“and”) rather than “va” (“or”) is used here. Again, this affirms that all four elements are required in discipline of speech. They are cumulative. Regular recitation of the Vedas is then added as a separate item, a different type of disciple of speech. I collect quotes, always seeking sources to verify their authenticity. As such, I have used this site many times to debunk—or in some cases verify—quotes of the Buddha. There are not many quotation sites that care about authenticity, and yours is an invaluable resource. Also, an attribution from 1847, apparently the same year Poynder published his Literary Extracts from English & Other Works, p. 160, can be found in the 4 November 1847 issue of The London Pioneer, p. 464, col. 1. Thank you, Hugh! That’s immensely helpful. I loved looking through all these entries. I learned a great deal. In the end, it’s damned good advice, no matter where it came from, and I will do my best to walk the path presented by the idea from here on out. Thanks to all for all they shared.